30 April 2016 "The Paranormal View"
Henry started pointing out my being absent; friends had sprung for tickets for the annual HP Lovecraft Film Festival, which I hadn't even been aware was this weekend! 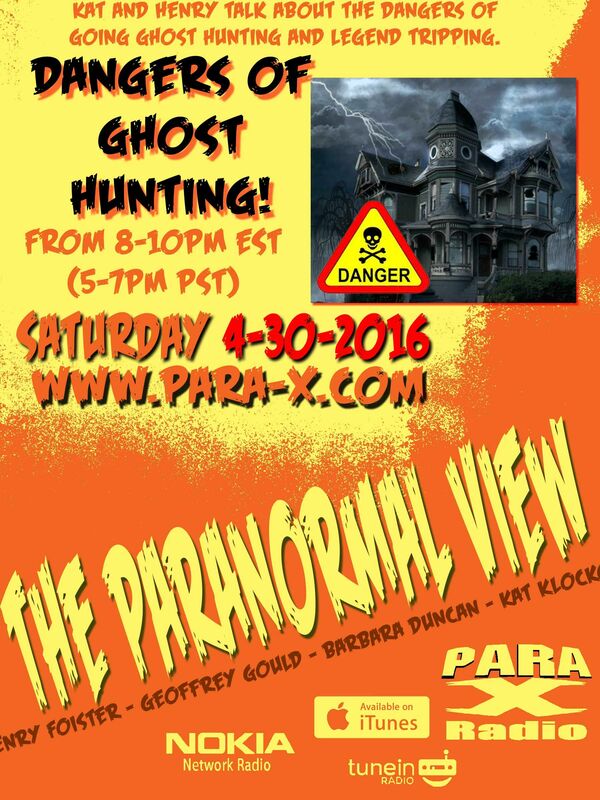 Kat gave out the show's theparanormalview@gmail.com email address, asking for anyone's stories. Henry and Kat pointed out the irritance of investigator wanna-be's who trespass. Kat stated how "legend trippers" are those who seem to do that the most. She clarified there are teens who do after-closing cemetery trespassing albeit generally as a Rite of Passage. Ceiling Cat Barbara Duncan answered Henry's query that it doesn't go very reported out on the west coast. Kat added that going "investigating" whilst completely drunk is generally not a very good idea. Henry reminded that oft times in such off-limits places could have asbestos, vermin, mold, unsafe floors, stairs, et al. Henry asked CC about her trip to the Brookdale Hotel; sadly she did not obtain any tangible evidence but Sensed a lot. She spoke about the hotel's history, and the young girl who died there, whose ghost is occasionally seen. Proper footwear was discussed: flip-flops are Right out. Kat read an email with an article about Ghost Hunters Find Woman's Body at Haunted Hospital. of a woman's body found outside a reputedly haunted hospital, ironically those having found her were most likely trespassing themselves. Another article was about another injured woman, who was trespassing in an abandonded winery in Clovis. Kat indicated one issue at places are allergins. She went to Bobby's Mackies, for a speaking engagement, having forgotten it's not a smoke-free establishment. Another article spoke of Sarah Harris dying of a lung infection from some contaminant inhaled at an investigation. Kat also added running across Strange People during investigations. On one investigation on which Kat was, in the group of which included one of the local deputies, had a drug deal go down in the cemetery they were visiting. The deputy called it in, and the group just went home. Henry spoke about one investigation he and Patsy went had a strong police presence due to the local area. CC indicated in cemeteries you have be careful of actual funerals, as well as overt religious ceremonies (voodoo). They discussed about hitch hiking ghosts, entities that follow home investigators, but Kat added her belief ghosts Cannot Harm living people physically, and the three felt there was No Proof of such, the Bell Witch Case, where it's said a man literally was killed by the ghost, not coming to mind. Kat retrieved a story from the email a story from Tabby Cat Gasch regarding her investigating a masonic lodge, during which she felt dizzy. Later she felt a hand pushing her hard as she ascended some stairs, getting a male EVP simply ordering, "Leave!" Henry and Kat recalled a another story of Cat Gasch feeling as though she was falling, and an unseen hand catching her. After the second break, CC reported tonight our having listeners in the US, the UK, Australia, Singapore, Canada, the Netherlands, Costa Rica, and Other. Henry and Kat reported that there was a question from the live chat room regarding bringing on investigations religious objects. CC referenced the 1979 movie Love at First Bite, stealing the joke from the 1967 movie The Fearless Vampire Killers of trying to use a cross on a Jewish vampire. Henry conveyed that he got some good Class A EVPs at the Gettysburg investigation. Kat was proud of Henry actually Seeing a ghost during their time there. Kat spoke of an article regarding Three Arrested in Reported Rogers County Sasquatch Hunt, during which one of the friends accidentally shot one of the others. The hosts warned against investigating where there can be gun fire. Another article regarding Ghost hunter stabs himself in the chest while staying overnight at ax murder house was conveyed by Kat. With the show winding down, Kat relayed a quasi comical story about Gettysburg ghost hunters mistakenly detained in after dark tour at gunpoint, by a cop who refused to believe at first that the legit ghost hunt was not a case of breaking and entering. Henry conveyed our guest next week would be author Tom Carey of Children of Roswell. Kat managed to get off a couple of my websites, and as they all signed off, Kat and CC's voices collided in saying goodnight; Kat also wished me one more Happy Birthday, and they wrapped out.